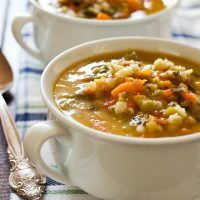 If you are not incorporating winter squashes into your menu this time of year – you are missing out. 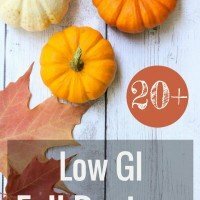 Winter squashes include acorn, butternut, buttercup, delicata, hubbard and spaghetti squash. All of them are very nutritious and fun to cook. Today, I am sharing with you this Spaghetti Squash with Basil Pesto recipe. 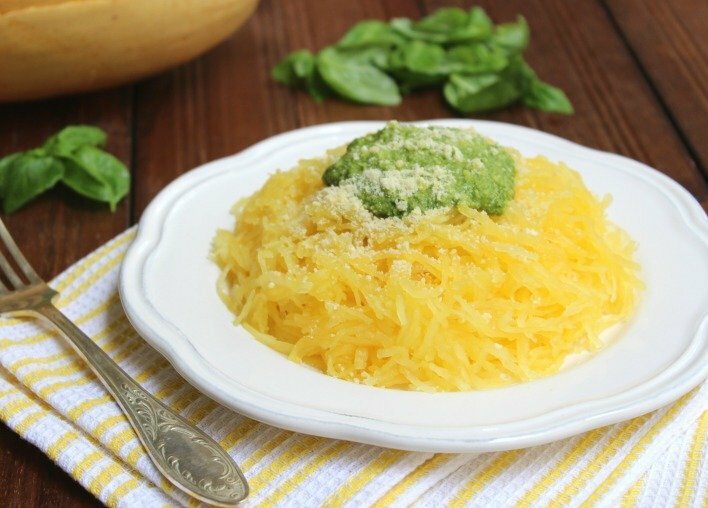 As the name suggests, the flesh of a spaghetti squash pulls apart into spaghetti-like strands. Just cook it, cut it in half and scrape out the sides using a fork. Spaghetti squash can be cooked whole and it is good news considering that it has a very tough skin and is extremely hard to cut. 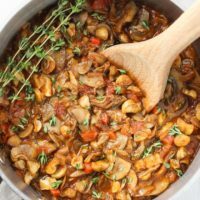 Try replacing (at least part of) your pasta with spaghetti squash on pasta night and top it with pesto or your favorite pasta sauce. 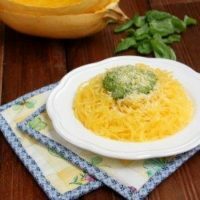 Spaghetti Squash with Basil Pesto Recipe. Cook a whole spaghetti squash, cut it in half and scrape out the flesh using a fork. Basil Pesto is done in just a few minutes. Rinse the squash under cool running water. With a fork or a small knife, prick the squash all over. 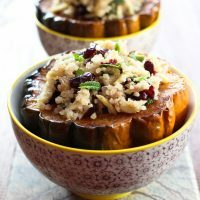 Place it on a baking dish and roast until the squash can be easily pierced with a fork, for about 1 hour 15 minutes. Let it cool. Once the squash is cool enough to handle, cut it in half lengthwise and remove the seeds and the pulp (see the notes below). 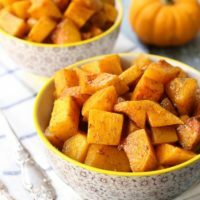 Using a fork, scrape out the insides of the squash into a bowl. To prepare the pesto, place the basil leaves, parsley, walnuts, water, lemon juice, garlic powder and salt in a blender and puree. Add the olive oil and pulse a few more times until blended. 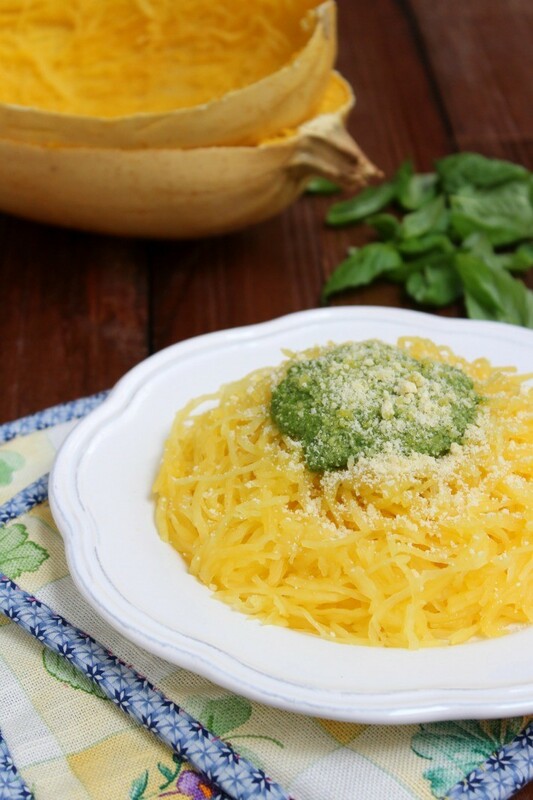 To serve, top the spaghetti squash with the basil pesto and sprinkle with Parmesan cheese. Spaghetti squash seeds are very tasty too! 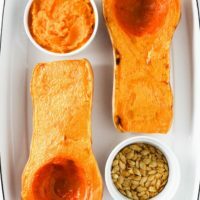 To prepare the seeds, preheat the oven to 375F. Wash the seeds to clean them from the pulp, pat them dry with a paper towel, spread out on a baking dish and roast them until they are dry and crunchy, for about 20 minutes.